Iggy Azalea humiliates her boyfriend, LA Laker Nick Young, callously pushing him out of the frame in front of a throng of paparazzi at the Billboard Music Awards. The paparazzi — who don’t know Nick from a hole in the wall — asked him to move along several times. 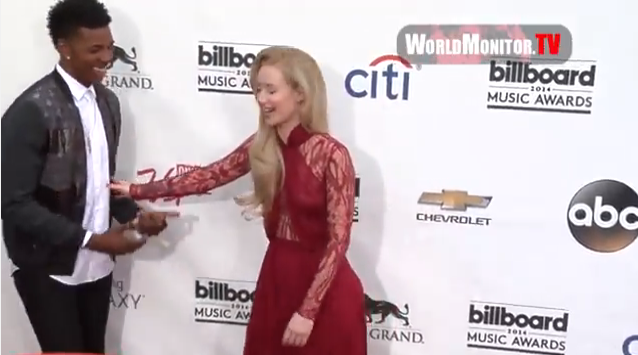 And when he didn’t move fast enough, Iggy shoved him aside so she could hog the spotlight. If it wasn’t clear to Nick that Iggy used him for a come up, it was very clear to the rest of us. Her body language was unmistakable. CLEARLY she didnt want to acknowledge thats her boo!!!! Soooooooooo he's good enough to f*&% but thats behind closed doors right??? SMH.. NO WONDER ALL OF YOUR SONGS ARE FLOPS!!!!! T.I. COME GET THIS BISH!!!!! Their "relationship" is for PR purposes anyway, mainly to give her more press attention, since only 1 of the 3,082 singles she's released is an actual hit in the U.S. I give this "relationship" a couple more months before her people try to set her up with someone more high-profile. He wanted in so desperately. Fall back. Ummmmmm - she is Australian, not British.